Yes, of course there are garden shade plants that will brighten up the area for you. Some of them are foliage or greenery plants and some of them will also flower. From your question I presume that you want to plant into containers and baskets. Shade gardens can be very attractive and if well done have a really exotic flair. The key is to work with different textures and foliage colors. Some nice garden decor can complete the picture. Impatiens or Bizzy Lizzies: Flowering annual plant. Flowers are white, red or pink. One of the best annuals for shade. Begonias: also a flowering annual. Flowers are white, pink or red. You can also get trailing varieties or ones with dark foliage. Fuchsias: trailing Fuchsias add a splash of color during the summer. You can combine these annuals with Ivy or ferns. These also work on their own in the hanging baskets. Helleborus: spring flowering perennial. Hellebores come in white, pink or dark reds. Hostas: Very attractive foliage plant for shady areas. 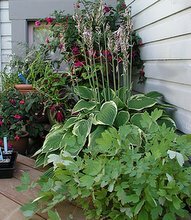 There are many different varieties of Hostas available. Some have variegated or golden foliage, others have bluish-green foliage. They also flower during the summer. Heuchera: foliage plant. There are many different varieties with golden, green or dark foliage. Pulmonaria: perennial plant with spotted foliage and blue flowers. Ferns: try Anthyrium, Polystichum or Asplenium ferns. 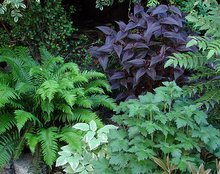 They add nice foliage and texture to your shade garden. Buxus: shaped box trees can look very attractive in a nice container! Camellias: spring flowering evergreen shrub. Remember to use lime free compost for this plant! Viburnum tinus: Laurustinus is a nice evergreen shrub that bears white flowers in early spring. Hydrangea macrophylla: summer flowering shrub. Try the more compact Hydrangea varieties for pots. Skimmia: evergreen spring flowering shrub. Female varieties have bright red berries in the spring. Aucuba: Evergreen shrub with spotted or variegated foliage. Bamboo: different varieties of bamboos will bring an exotic flair to your shade garden.